Twig & Thistle's blog has a great DIY that has a simple but elegant look. I love the way that it has a natural look but really brings the holidays into the home. 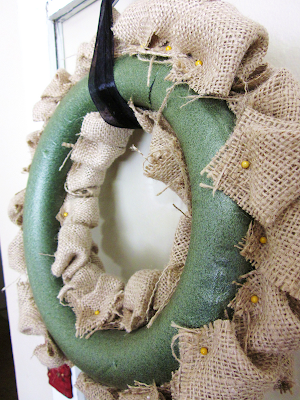 Also, I spotted this door decoration that uses the same materials that would make a lovely companion to the garland. Instead of stringing the pine cones to the ribbon simply tie a ribbon to each hook then tie all the ribbons at the top and hang! 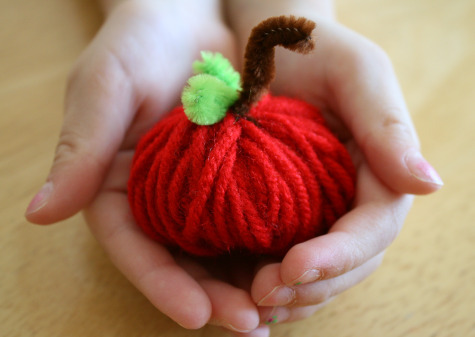 With Thanksgiving just around the corner - we think it'd be super easy to adjust this DIY from Bloesem Kids' blog for fun Pumpkin Placemats! As we celebrate the harvest season here in the US, it's nice to get the kids involved in decorating the holiday table. These cute apple placemats are painted using a freezer paper stencil, a technique easy enough for kids. Freezer paper can be found at many grocery stores or online, but be careful, once you start you'll be stenciling every thing in sight. Cut your burlap to 13" x 17". On the heavy paper, sketch your apple, refining your drawing until you're happy. Cut the apple out and trace around it on the paper side of the freezer paper. Cut the apple out of your freezer paper, making sure that the area surrounding the apple is uncut-- this is your stencil. 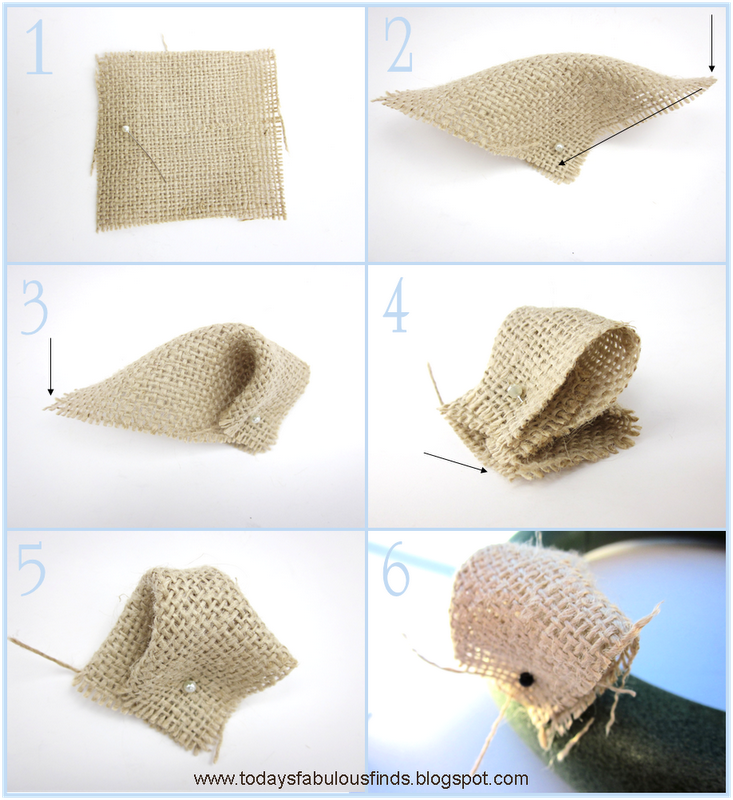 Place your stencil on the burlap where you would like it and iron it in place. Using the wide paintbrush, paint the area inside of your stencil with the red textile paint (tip: I used both foam and bristle paintbrushes and preferred the bristle). Carefully peel your stencil away. 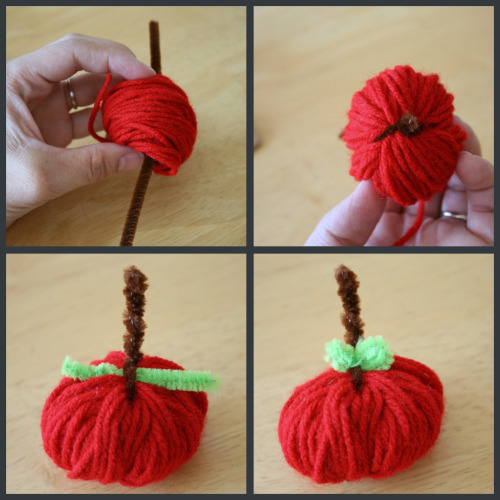 Using the narrow paintbrush and the brown paint, paint the stem on your apple. Cut a leaf from your printed fabric. Glue it next to your stem just above your apple. 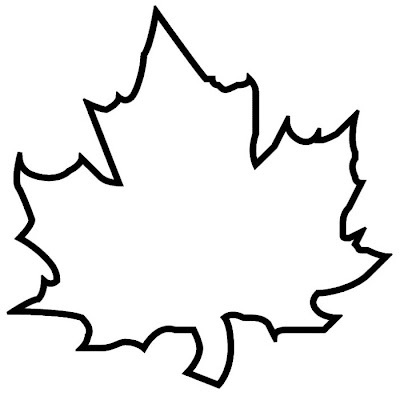 If desired, use the marker to draw pretend "stitches" on the leaf. 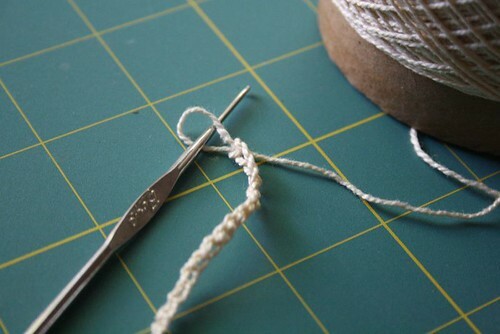 One at a time, pull four or five threads from each edge of the placemat to create a fringe. Repeat until you have a placemat for every seat at your table. 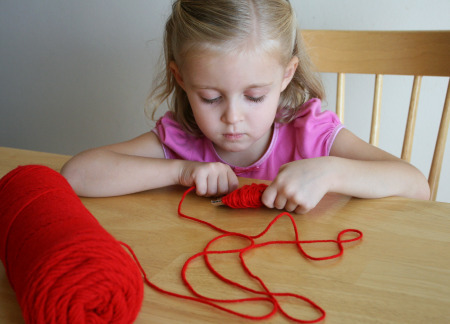 A Foothill Home Companion has inspired us to get back into crocheting. 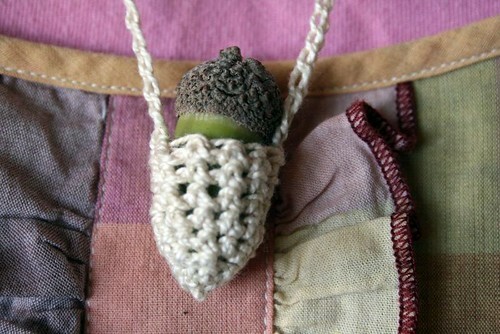 We are excited to do this one and can't wait to pull out some yarn and search the yard for acorns missing their caps! We set about gathering acorns to make more necklaces, but found that most of our acorns are loosing their caps on the way down, or on the way home in Aidan's pockets. So I reverse engineered Resurrection Fern's pattern for acorn baskets to make acorn caps. 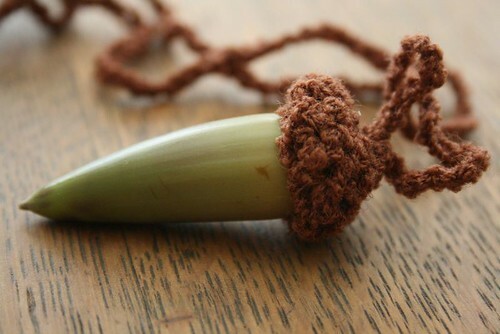 Chain desired length of necklace. Mine was close to 24 inches. Keep in mind that it will go over your head. Chain five more, slip stitch to fifth chain from needle to form circle. 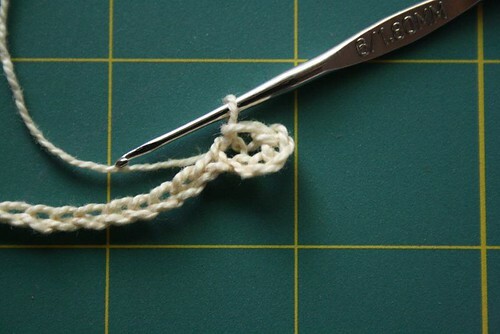 One single crochet stitch in each of the five chain stitches to make first round. 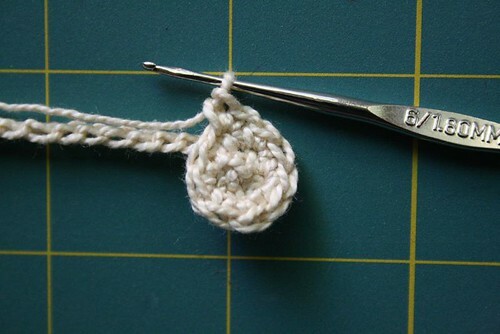 For the second round, crochet two single crochet stitches in each of the five stitches to make ten stitches. 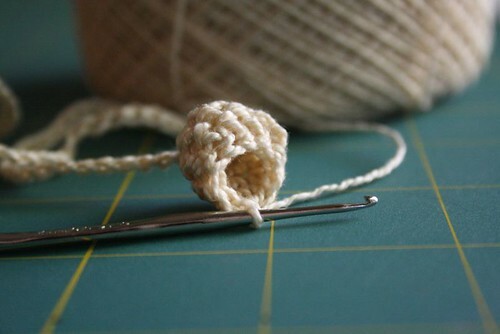 Single crochet one stitch in each of the ten stitches; work two to three rounds until cap forms and reaches desired size. Slip stitch to finish cap and weave in yarn. 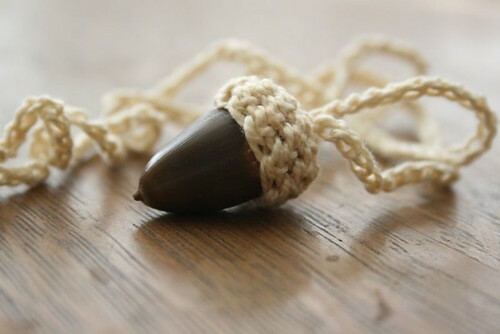 From inside cap, pull the end of the chain through the middle of the cap with the hook, slip stitch inside cap to anchor and weave in end of yarn. 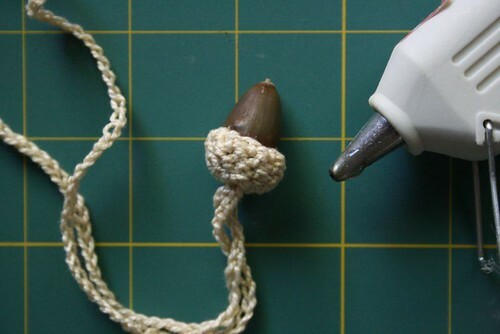 Use a hot glue gun to attach cap to acorn. 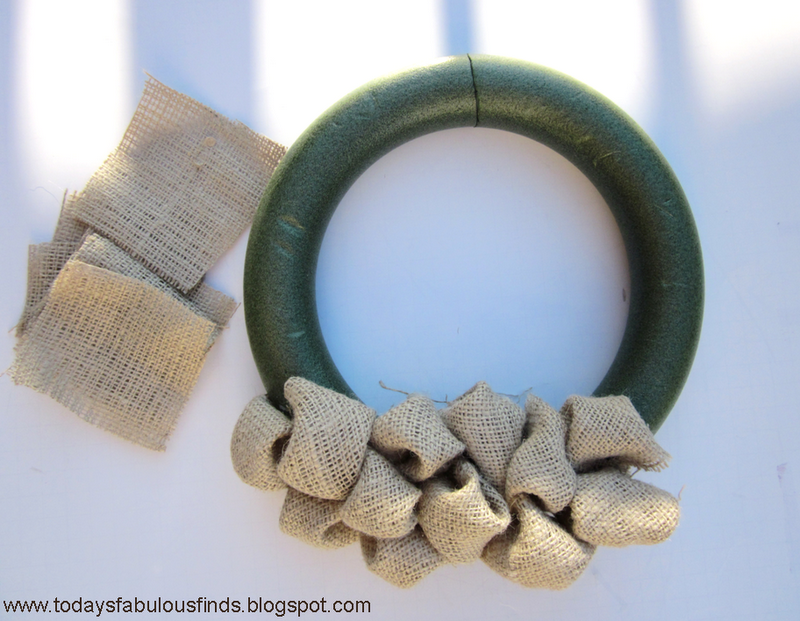 Today's Fabulous Finds - Tomorrow's Treasure's blog is really amazing at taking step by step pictures and explaining everything she does no matter how seemingly small. This makes it incredibly easy to duplicate her stunning results!! (You can use small headed pins for fabrics with a tighter weave. I used a white pin in the pictures to show where you will hold the fabric with your thumb and index finger when folding it. You don't need to pin it until step five. 1. Cut your fabric into 4" x 4" squares (or close to that). I cut one square first to make sure it was the size that I wanted and then used it as a guide to cut the rest of the squares. Cut the fabric into 4" strips and then cut each strip into 4" squares. The squares don't need to be measured and cut precisely if you don't want to take the time, but should all be cut pretty close to the same size. 2. Fold the square in half to form a triangle. Take the right hand corner (pinch one layer of the fabric on the very tip) and bring it to the front. Line up the corners. 3. Take the left hand corner (pinch one layer of fabric on the very tip) and take it to the back. Line up the corners. 4. All four corners should be lined up at the bottom. It should look like a bubble now. 5. Pin through all four layers of fabric. 6. 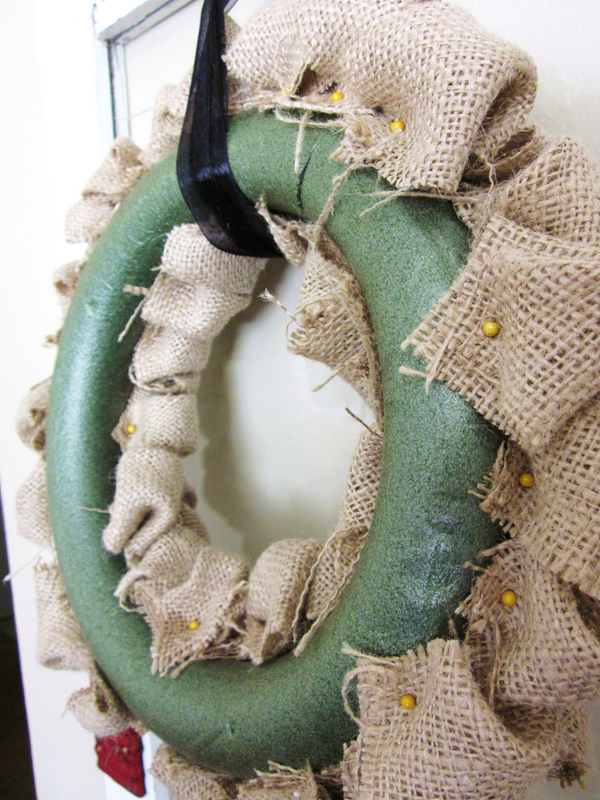 Pin the 'bubbles' to the wreath. Pin one bubble on and then place the next one close to it so that it hides the pin on the one that you just added. 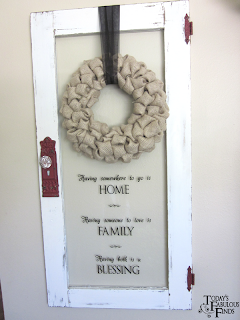 The bubbles should be just close enough so you don't see any of the foam wreath or the pins. 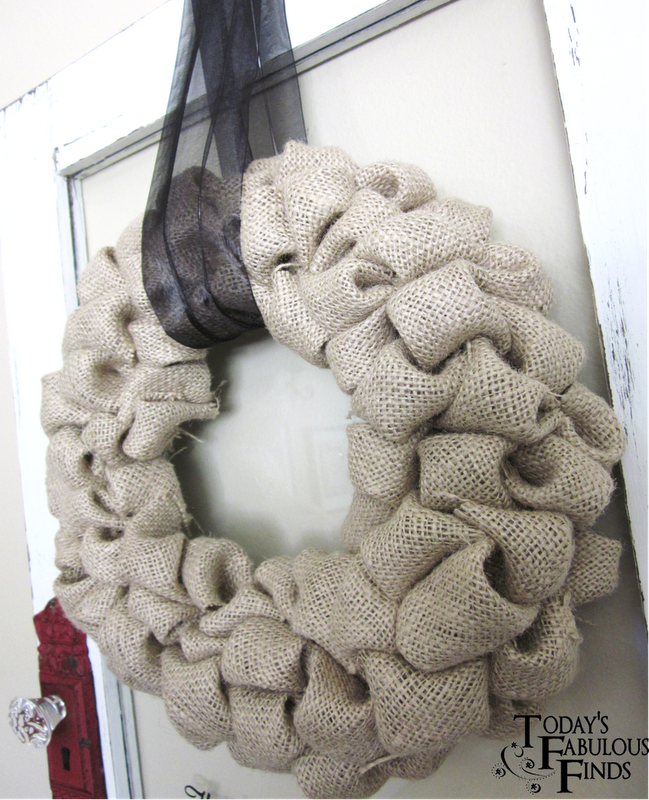 To give you an idea of how many it will take, I used just over 90 burlap squares for this wreath. Thanks to Martha Stewart - who knows the most amazing ways to jazz up any home decor - we are featuring this wonderfully simple DIY on pumpkin pie potpourri. It's so easy it's almost ridiculous - almost! Plus now is the perfect time to cut into those pumpkins and they won't spoil! 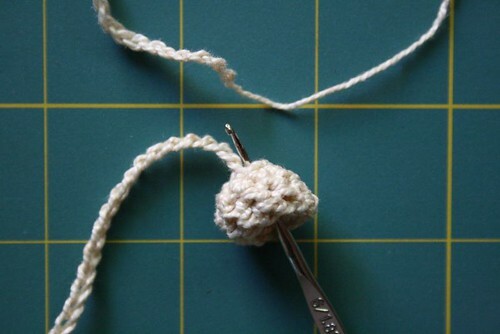 Abernathy Crafts made such an easy yarn wrapped ball tutorial, we know this is just perfect for those left over pieces of yarn from crochet projects! So easy, but soooo pretty. We LOVE it. Check them out for more! I didn’t know what else to call them. 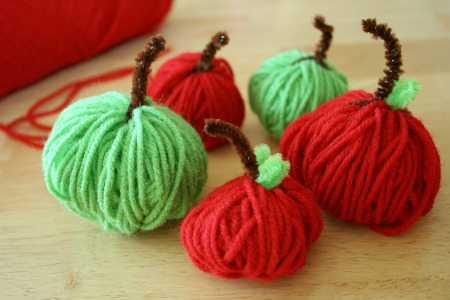 They’re balls, wrapped in yarn. Yarn balls. I know, it’s silly. But if you’d like to know how to make some to add some pretty silliness to your space, I’ve got a tutorial for you. Before I started on this project, I read on Pinterest that you can dye your skewers using food coloring. So I tried it. I filled a glass baking dish with water and several drops of food coloring. Then I soaked the skewers overnight. The next day I discovered that it didn’t work. So then I added the entire bottle of food coloring. That did the trick. So apparently it does work but you just have to use a ridiculous amount of food coloring for the wood to soak up. So, start by shoving the skewers lovingly into the Styrofoam balls. Pointed end in works best. 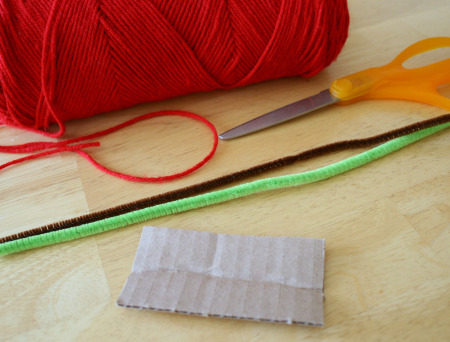 Starting at the bottom around the stick, spread some glue and begin wrapping the yarn around in a spiral. 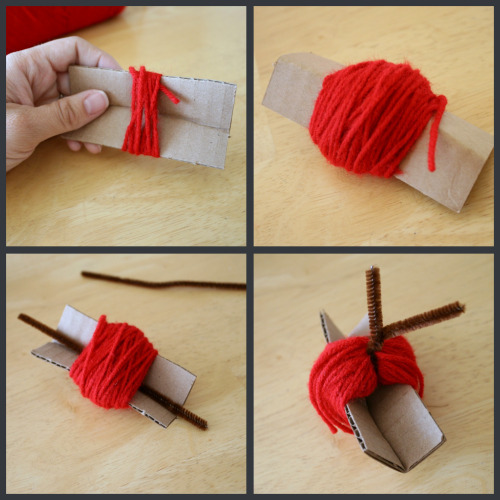 Keep gluing and wrapping the yarn around until you get to the top. 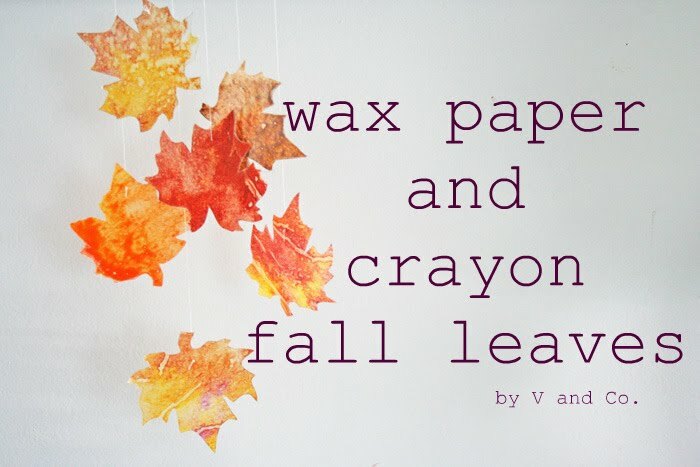 V and Co.'s Crayon Wax Leaves are wonderful. They make the perfect window accessory and we can even see a wreath being made with these wonders!